Herald Design Forum 2018 kicked off Friday at Dongdaemun Design Plaza. Distinguished speakers, design experts and government officials are among those participating in Asia’s leading design festival, which runs through Saturday. “The forum, which started in 2011 with our belief that design can change the world, is now holding its eighth edition. Over the last seven years, Herald Design Forum has invited numerous distinguished guests in different areas, industries, engineering, architecture, fashion, design, city planning and many others to share insights and ideas about design. 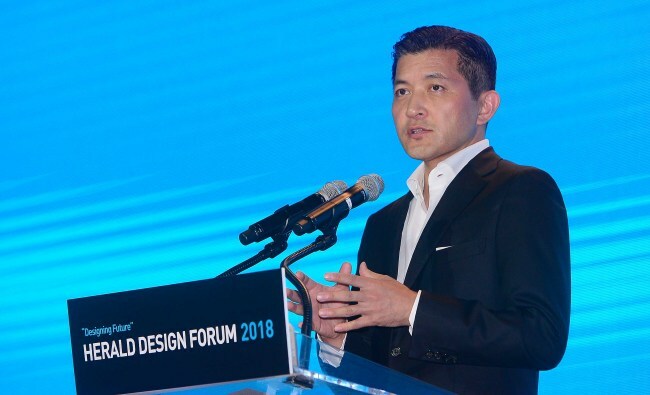 “And now, the design forum has grown into the world’s leading design forum,” said Herald Corp. Chairman Jungwook Hong during the opening of the forum. “With ideas only, no changes can be made. A difference can be made with 1 percent idea and 99 percent action that follows. While we have been discussing design, the world has changed more dramatically at a faster rate. The issues we are to solve have become much more complicated. Thus, design should now go beyond imagination and make efforts to bring actual changes,” added Hong. Also attending the opening ceremony was Chung Jae-suk, newly appointed administrator of the Cultural Heritage Administration. Around 500 design enthusiasts are also attending the forum.